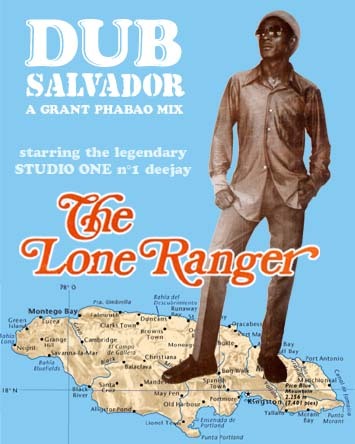 Thanks to the incredible production skills of French dubmeister Grant Phabao, who crafted for him a splendid album last year ("Kulchaklash" / to be pronounced "Culture Clash"), The Lone Ranger is now back on the charts, with rub-a-dub partner Carlton Livingston and their cover of Dandy Livingston's hit "(A Message To You) Rudie". This new single is making waves all over the irie globe on a strictly limited edition 12 inch (500 copies only! ), issued on T.I.M.E.C./The Pusher in Europe (with both extended and dub remixes), and on an already out-of-print 7 inch, issued on Silver Bullet in Jamaica. This marvelous slice of pure jamaican spice is a winning crowd-pleaser sure to hit the spot every time, we couldn't let it out of this exclusive mix of oldies, rarities & classics, so... enjoy! Lone Ranger - Tribute To Bob Marley + Keep On Coming A The Dance / on "Studio One DJ's 2"